First off, let me just say that I had remembered hearing about dad’s bike when I was a kid. 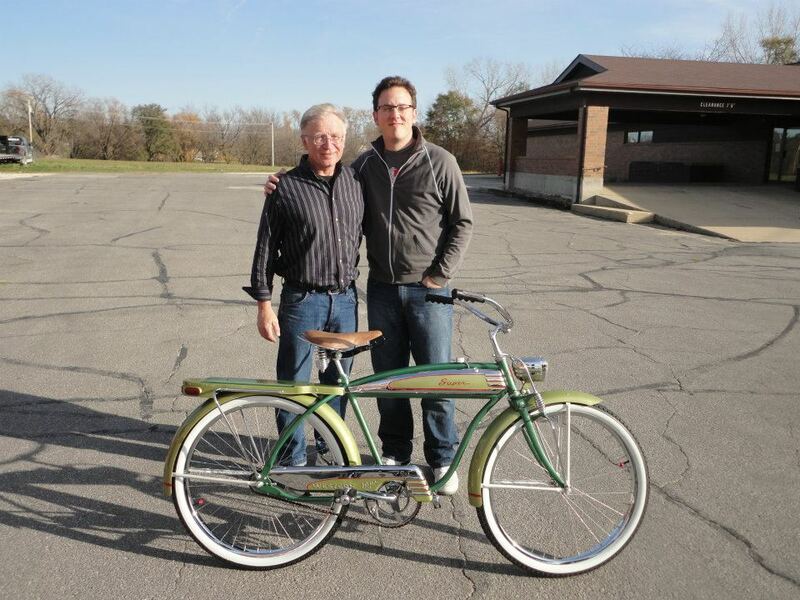 It was hard for me to grasp the concept of a bicycle having all of the things dad told us about it…tanks, a carrier, headlight, taillight, turn-signals, a horn…and what he then called a “knee-action front end.” It was dad’s pride and joy as a child. He doesn’t recall for sure if it was a birthday gift or otherwise and there, surprisingly are no photos of it from when he got it…or even any of it sitting in the background of a photo taken of something else at their house in the 1950’s. Needless to say, this bike always intrigued me. At the time, I was in full-blown BMX bike mode and instead of watching the Lone Ranger and saddling up on a Western Flyer, I was setting up makeshift ramps in the driveway that I would put to use after viewing the latest episode of the Dukes of Hazzard in the early 1980’s. Having said that, I also took an interest in everything “old” and was heavily influenced by the stories and relics of my parents’ era. I grew to love everything of the baby boomer era and even before. As a little kid, I was listening to Elvis, Chuck Berry and Buddy Holly and becoming engrossed in the process of my dad restoring classic cars and going to car shows. 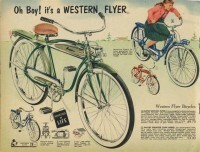 It wasn’t just cars or bicycles or the music or anything specific….it was that whole era- 1930’s – 1960’s Americana. It was streamline, it was chrome, it was bakelite. Every year on Memorial Day we would go to my dad’s tiny hometown of Elma, in northeast Iowa and he would march in his Navy blues with the rest of the local veterans. It was when my dad went in the Navy in 1962 that his Western Flyer was left behind and ridden by dad’s younger brother, Ronnie…who didn’t have the connection to it that dad did. So, instead of being meticulously maintained, it was probably now just a way to buzz around town. It got banged up, used and abused and one of the times when he came back on leave, Ronnie told him how he was riding down the street with it, with their cousin Terry riding on the handlebars, when the spring fork broke under the weight of the 2 of them bouncing on it. In dad’s words “and after that, it just laid around for years.” That was probably 1963 or 64 and the years turned into decades. and put it in the back of dad’s truck. Now it was mine! As you might expect, I didn’t know much at all about the hobby at this point. There was an old man, Mr Maschek who lived in Charles City, where my parents lived and I went to school. Dad knew that he had old bicycle stuff, so we would stop by there periodically and he helped me find a set of old rims and a skiptooth Bendix hub that would at least get the old girl up and moving again. I never really knew how far I would take things with it… the idea of somehow finding all the missing parts for it and even knowing exactly what it originally looked like seemed so far fetched to me that that time. I got some old bike parts from the old guy in town and probably found out about Memory Lane by flipping through one of dad’s Hemmings Motor News. I’d write letters to them and ask questions….they’d help me with figuring some things out….but they knew I was just a kid and probably assumed that this restoration would go nowhere. Things were drastically different prior to the internet. I’d write them a letter and hope to get one back the same month. I’d contact other people/publications who were referred to me…Newsletter by John, etc. Larry and Harv at Memory Lane sent me a black & white copy of an original advertisement and a photo of a Super that they had on hand. I’d do my best to locate parts that seemed like they “could be close to what was originally on the bike.” I’d find decent old parts for other bikes of the era and trade with people who had what I needed. I graduated high school, I graduated college and begin attending a swap meet every year in Des Moines, Iowa, hosted by Alan Kinsey. It was at these swaps that I began conversing with real passionate collectors. I found my 3-rib headlight there, along with original grips and chainguard. I talked to a guy who was going to the Memory Lane swap and agreed to find me a Delta turn-signal switch. All of these were key pieces of the puzzle. Some time in 1999, I was turned onto eBay. There I could stumble onto parts that I could either upgrade my existing parts with….and even find obscure stuff that I’d never seen before. Original Western Flyer owner’s packet and warranty documentation, original ads, accessories like my NOS Western Flyer Speedometer and NOS mudflaps were all found on eBay. I was 16 when I recovered Dad’s Super from that pile of rubble. I made progress every year….some less than others…but progress nonetheless. I returned to graduate school at Iowa State University and began pursuing a Masters degree in Product/Industrial design. The influence of balloon-tire bicycles would once again prove beneficial. 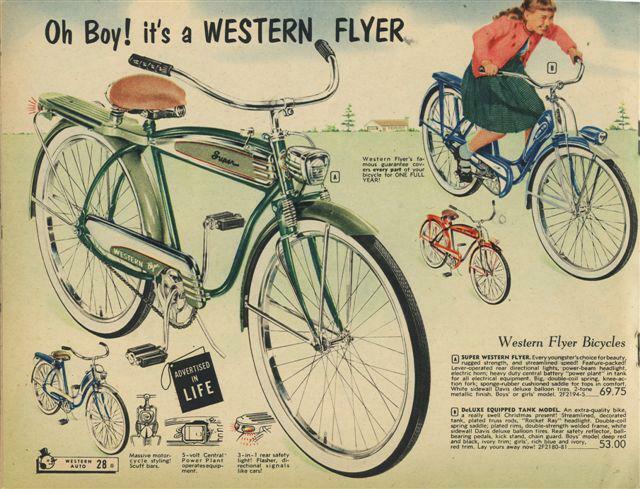 My Masters thesis topic was: “The role of the bicycle in the development of early American streamlining.” After completing my thesis dissertation and graduating, besides landing a good job, my renewed focus was on getting dad’s Western Flyer Super restored, once and for all. Even where it was easier to use replacements, I paid to have the old original parts refurbished. It was very important to me that as much of the bike as possible be original…and what came on dad’s bike on day one! Of course, many items were missing. 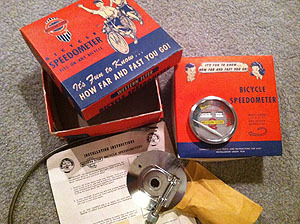 Original rims, hubs, front fork, headlight, turn-signal switch, front fender, chainguard had all long since disappeared. I had no choice but to replace those. I bought a donor Super from a guy in Florida. 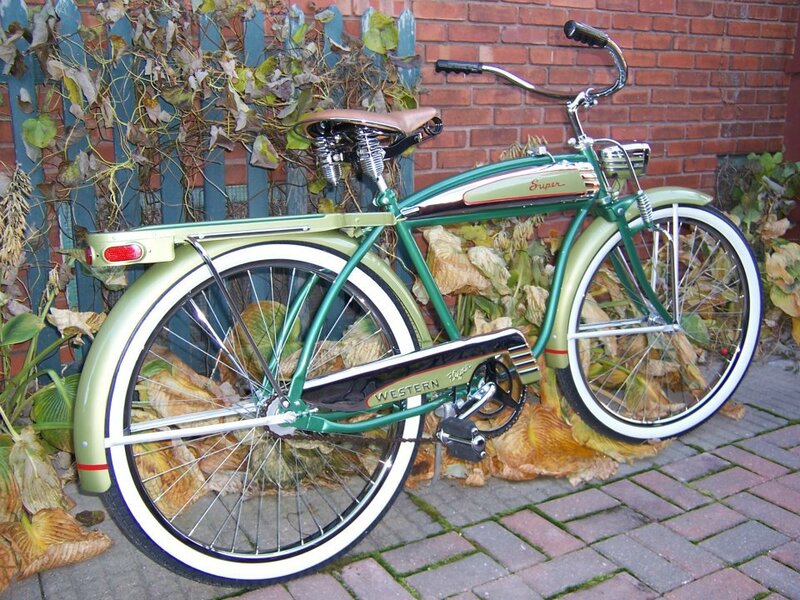 The front fender, rims, gooseneck and Delta turn-signal unit for the carrier would come from that bike. Other items were more complicated. 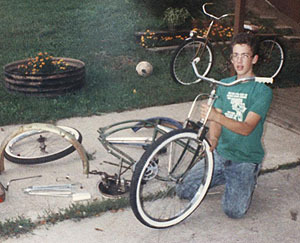 I had the original Wald kickstand, but its length had been shortened by years of being kicked up off the sidewalk. I found an identical one and used the measurements of it to determine how much rod to weld onto the original kickstand length, cut and file. Local welding shops helped with the welding of things and heating the original crank to bend out to original specs. The same was true for the rear carrier chrome scuff guards. I had multiple replacement bars I could have used but I couldn’t let myself do it, If I had any original parts, I did whatever it took to refurbish them. Both rear crash guards were broken at the lower end, at the ear, where they mounted to the frame. Both were bent, scuffed badly and untrue from the many years of the bike being tipped over. Welding, straightening, filing and rechroming has them looking as new! I had one of the rear axle/chain adjustment screw threads in the frame re-tapped, that had been stripped out. By looking at photos of unrestored Western Flyer Supers, I took notice of subtle details. I knew by the serial number on dad’s Super meant that it was a 1951. I knew from seeing photos of other original Supers that two different types of goosenecks were used, any number of different styled black grips, and even the “Super” logo itself varied from year to year or just according to what company was providing them at the time. 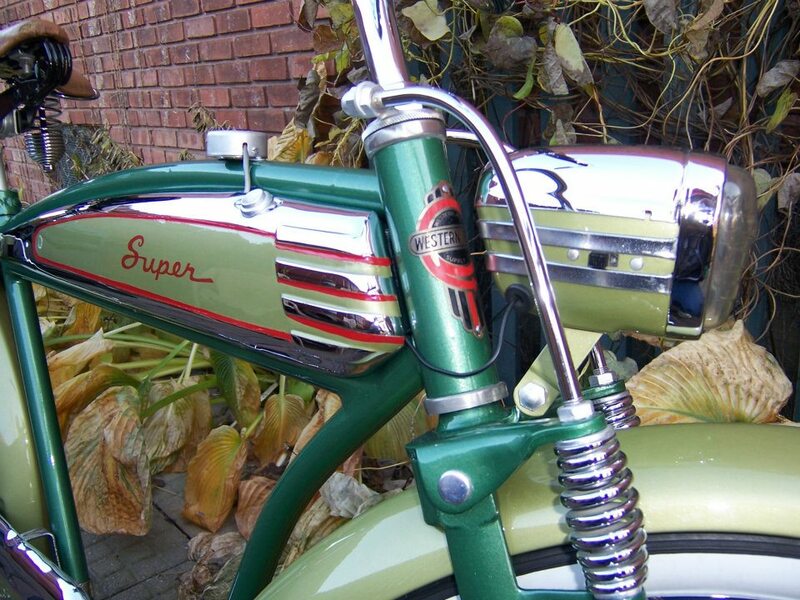 Whenever dad coudn’t remember what specific item was used on his bike, I always fell back on using what was pictured in original advertisements, and used items that I knew came off of other Supers of the same vintage. After working and saving up for awhile, I decided the time had come. My dad was at a car swap meet in Cedar Rapids, Iowa and ran into a guy who had several old bicycles for sale and told dad that he and his son “recover saddles and restore bikes from time to time.” Dad got his contact info, and after considering several other cycle painters, I decided that it was relatively important to me that the bike be done locally, so that I could have input on the process and be satisfied with what I was getting. Plus the added bonus of DAD finding out about the guys who would eventually do the paintwork on his childhood bike just seemed like poetic justice! One of those guys, Mike Todd of Washington, Iowa, went out of his way to make me proud of all the time and effort I had put into dad’s bike over the years. Mike blasted the painted parts, straightened, filled, and primed everything. I made it clear during the entire process that I wanted Dad’s bike to have as many original components as possible. 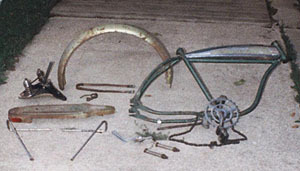 Some restorers prefer to “dress up” a bike when doing a restoration. I wanted dad’s bike to look just like it did new. Whatever was originally CAD plated, should be just that. Whatever was chrome would be rechromed, etc. I had every single CAD piece (kickstand, fender braces, nuts, bolts, brackets, turn-signal switch, hub components, head tube bearing cups, etc) replated by Detray Plating in Independence, MO. I found a NOS New Departure Model D rear hub on The CABE and had an NOS ND hub for the front, original rims from my donor bike, Torrington double-butted spokes to re-lace the rims with. Chroming went to Proctors in Michigan, and though I was initially dissatisfied with several components, they made it right in the end. After consulting with the Saddle Shop, I searched high and low for a seat cover material that would match more closely than what they had on hand at the time. I came across a vinyl (which is what the original material was) that matched almost identical. I purchased a yard of the material and had the Saddle Shop do the Persons embossing and mounting of the cover/padding. Everything in a good restoration rests in the details. I scanned the Super decal on my then-fiance’s unrestored Super and used it to make an identical water-slide decal for Dad’s bike, I did not want to use vinyl decals as they have a depth and color to them that did not match the original decals used. My siblings, close friends and family usually have a Halloween party every year and last year was no different. I had been closing in on having everything done on Dad’s bike and decided that inviting my parents to the party would make for a grand unveiling. 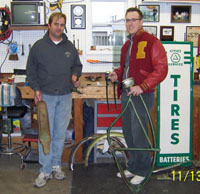 Of course, dad knew I had been working toward getting his bike restored forever, BUT he hadn’t realized that 2011 (almost 60 years to the month that he first got it, in ’51) would be the year I’d finally get it done! I lived in an old 2 story brick “Main Street” building at the time and there was a freight elevator in the rear of the building…so I decided that after all the family was there, we would tell dad that “an old family friend” was wanting to make a surprise appearance before the party started. We all gathered around as the bike came up on the elevator as I opened the doors. Dad was more than surprised. We took it out to the parking lot outside and he was the first person to ride it. I told him jokingly but half-seriously that “if he scratched it, I’d kill him!” He has a lot of satisfaction in knowing that his trusty old childhood partner-in-crime will ride on through the history of our family. Having had this bike since I was 16 years old has made it part of my youth as well. It truly IS one of my most prized possessions. I was married to my bride this past October 27th and we had photos taken of us with our His/Hers Supers for several of our engagement photos. I’ve included a couple of those photos here. 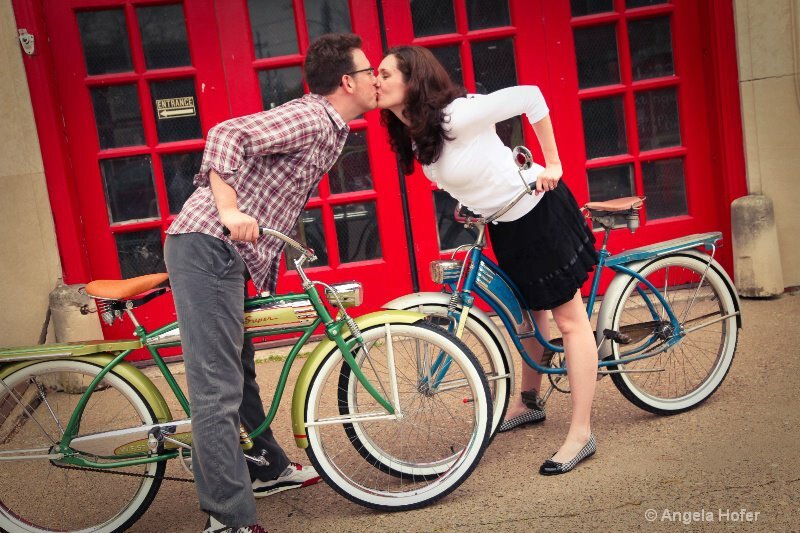 Every classic bicycle has its own unique story. 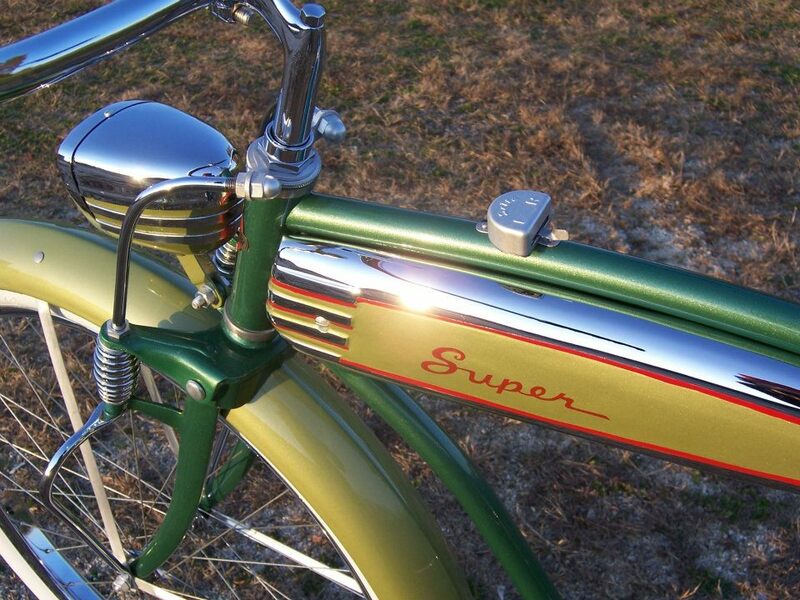 One thing I’ve learned in the process of restoring dad’s childhood bike, a 1951 Western Flyer Super, is that by the time I was satisfied that I had given my all in the restoration, I had actually had the bike longer than dad originally did. He just happened to have it when it was NEW!